Exercise can add years to your life by helping to improve flexibility, strength, energy and coordination – lessening your risk of injury. You don’t have to be super-fit because every little bit of exercise counts, and just getting started is a giant step forward for those who have been inactive. No matter how much time or effort is spent, the benefits of exercise are meaningful. While many of Cape Coral’s parks have walking paths for people to enjoy, a few of the parks also have special fitness equipment intended to assist with strength and conditioning. All of the fitness equipment is marked with instructions for proper use and designed for adults and responsible juveniles; however, individuals with health problems should consult a physician prior to beginning a workout routine. * Inner Loop – “Life Trail” – This .2 mile lower impact fitness trail includes extensive equipment and instructions for exercises such as forearm rolls, standing push-ups, single leg balancing, hamstring stretch, seated curl, bench stepper, partial lunge, and upper body stretch and strengthener. In addition, large informational signage located throughout the different fitness stations cover such topics as exercising benefits and tips, healthy eating, the importance of good posture, fall prevention, an overview of arthritis and osteoporosis, and introductions to yoga and tai chi. * Outer Loop – This .4 mile higher impact fitness trail extends around the perimeter of the park and is designed for pedestrians and cyclists to enjoy. Some of the extensive fitness equipment located along this path include rowers, dual exercise bars (push-up and pull-up), a leg press, air walkers, 2-sided rotators, a sit-up bench, sit-up boards and a pommel horse. Instructions for proper use and repetition recommendations can be found at each station. Saratoga Lake Park – Open from sunrise to sunset daily, this park includes a single fitness path around the perimeter of the park. The trail includes 12 stations with basic equipment and instructions for exercises such as leg stretches, jumping jacks, chin-ups, bench leg lifts, and more. Del Prado Linear Park - Open from sunrise to sunset daily, this park was developed along Del Prado Blvd as part of a road widening improvement project between Pine Island Rd and Kismet Pkwy. The two mile long sidewalk runs on both sides of Del Prado Blvd with eight (8) fitness stations, park benches, bike racks, etc. being located on the east side of the road between Diplomat Pkwy and Kismet Pkwy.The fitness stations include equipment that was designed for static and dynamic stretches; pulling, back, angle bar and hurdle; squat, dip, push-up and balance; power and agility step; core, torso and balance disc. Jaycee Park – Open from sunrise to sunset daily, this park is situated on the banks of the beautiful Caloosahatchee River and the fitness area is located near the front parking lot between the restrooms and playground. The “ParCourse” Fit Circuit offers 15 exercise events at 8 separate stations which focus on stretching and strengthening. Equipment includes a vault bar, sit-up bench, push-up bar, chin-up bar, inclined bench, knee lift post, bench dip/curl, and log hop. Lake Kennedy Park – Open from sunrise to sunset daily, the fitness area at Lake Kennedy is located at the front of the park adjacent to Lake Kennedy Center. Exercise stations in the area include a Hand Cycle, Chest Press, Leg Extension, Balance Plank, Sit-Up Station, Push-Up Station, Upright Cycle and Chin-up Station. Since the equipment selected provides a full body workout, the area has been officially designated as a "National Demonstration Site for Adult Fitness" by PlayCore, joining over 150 communities across the country in a network of best practice sites. There is no fee to use the equipment, so make it a point to get out to Lake Kennedy Park and give it a try! The “Iron Mountain Forge” fitness center has 10 stations intended to help improve agility, strength, and muscle tone. Some of the different exercise equipment includes the challenge ladder, balance beam, vertical ladder, sit-up and spring-up benches, parallel bars, and a beam run. Rotary Park - Open from sunrise to sunset daily, the fitness area at Rotary Park is located on the east side of the property adjacent to Liam J. Perk Playground. The "Energi Prime Total Body Fitness System" has several stations designed to work different parts of the body with various exercise options and progressive levels of difficulty illustrated on large colorful signage. Some of the areas of focus include: Power Step Excercises, Core & Torso Excercises, Dynamic Stretches & Active Movement and Agility Step Exercises. 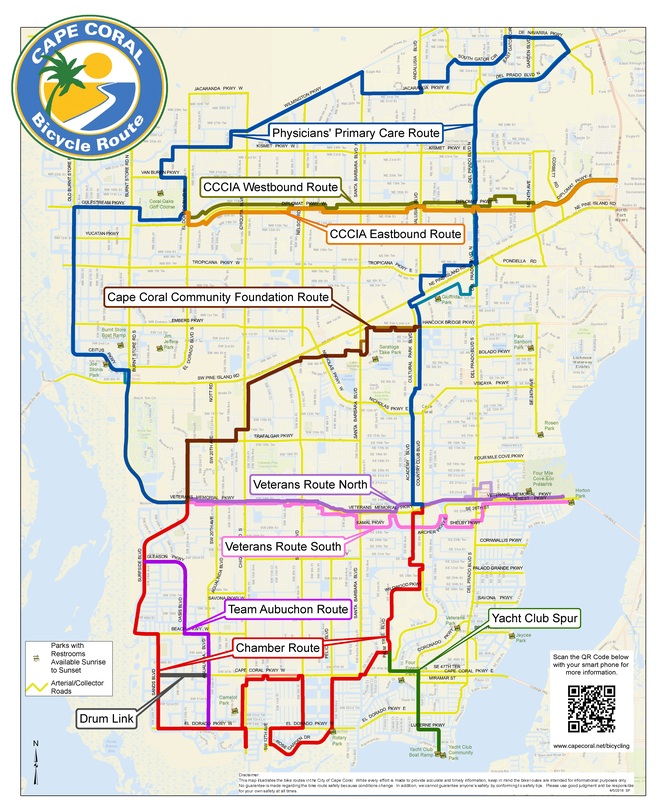 The City of Cape Coral and Cape Coral Hospital have also partnered to create a "Memorandum of Understanding" intended to promote each other's public facilities and encourage health and wellness. The hospital's new "Pathway to Discovery," located on the west side of their Del Prado campus, features walking/jogging paths, exercise stations, a reflection pond, a healing garden and a teaching garden. Take advantage of this free community resource! Pick up a map in the hospital's main lobby or click here to view the "Pathway to Discovery" map. Regardless of how or where you choose to exercise, the best results are often achieved when you remember to think "F.I.T." (Frequency, Intensity, and Time). When combined with a healthy diet, good fitness, and all the benefits that come with it, can greatly improve your quality of life.